There are a lot of things that I do that really make me smile. For example, pulling up my Fantasy Football scores and noticing that, thanks to the Detroit Lions, I won a game over Gary Bulson. Those times when I leave the office after a very hectic day, turning on the car and finding that the iPod is singing Dave Matthews to start the commute to a fabulous Jaycee event. Getting the occasional text from my friend Steve Pickelmann and his bro-mance partner John Badeen reminding me to bring my Presidential koozie with me the next time I head up to Frankenmuth or over to the L-I-V. There’s even that time I sat with my friends Mary Jo Knitter and Angela Wolf when we noticed our plane did indeed have pilots and flight attendants and we could finally escape Detroit Metropolitan Airport and head to the 2011 United States Jaycees Leadership Academy in Tulsa, OK. Yes, all of these things have made me smile and I’m sure that there will be 1,000’s of more things like these. When you think about it, for all of us, Happily Ever After usually comes along with various things that make us smile. What’s the point of living Happily Ever After if you aren’t going to smile? 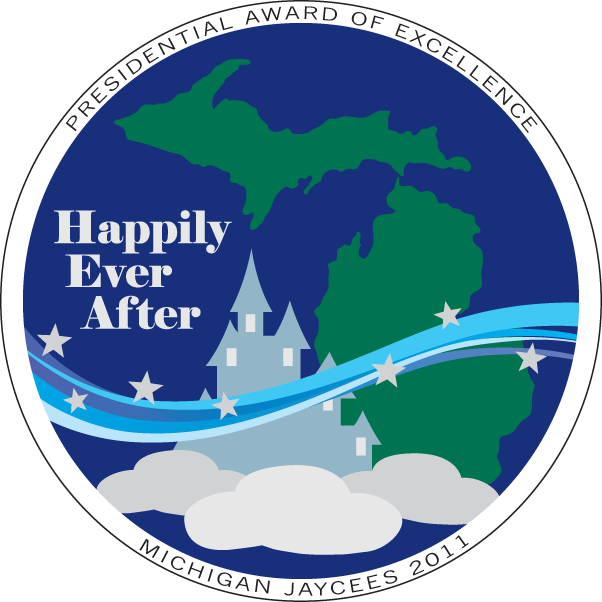 Now, thanks to the great work and the foundation that the folks from 2010 gave us, we are in a position where we can move forward with a number of changes that will transform the Michigan Jaycees into something that will always make us smile. This sentiment has never been so close to the truth as what we will do in 2011. You see this year, after years and years of talk, we have decided – together – that we’re going to implement change in the way that our organization operates. You’ve heard about some of them already. Electronic award submissions. ; a competitive awards program that no longer separates us based on size; an awards program that says to each of us “Be your best and let that decide who wins”; merging the Membership Area of Opportunity in with the ID Area of Opportunity. Let me touch on that one for a bit because it can be a bit of a scary concept. It can be scary because it is so close to the heart of the huge elephant that sits in the room. We’ve heard numerous times, “If we’re not growing, we’re dying!” You know, after a while of hearing that it can be very daunting to be the person or the team who is in charge of membership for our chapters. And whenever we change the ways we do membership in the Michigan Jaycees some hearts skip a beat or two. So right now, let me show you the best of the best. I need to have someone raise the house lights a little bit for me right now. If you are a Local Membership Vice President or a Local Membership Director, will you please stand up right now? Notice there’s a lot of people standing right now. If you look closely, you’ll see that I’m standing here with you as well. Change can be scary, but there’s no way that I’m letting you face it alone. Henry Giessenbier and Martin P. Luthy won’t let me. Plus there are a few other people who are here as well who are standing with us. For example, if you are a local chapter President – if you’re one of my Presidential peeps, will you please stand up? Looks like our team is getting a little larger and none of us are alone. We’ve all decided that we will succeed and be on a strong team together. And there are many others who are there with us. Don’t believe me? Watch this. If you’re a member of a local Board of Directors, if you’re an IDVP, a Management Vee Peep, a CDVP, a Secretary, a Treasurer, or other auxiliary officer of local Board, will you please stand up right now? If you are a general member of any of the 43 local organizations that call themselves “Jaycees”, will you please stand up right now? If you are a 2011 Region or District Director will you please stand up right now? If you are a member of the 2011 Michigan Jaycee Board of Directors, please stand up. Notice, there are a lot of people standing up right now, all dedicated to the proposition that Service to Humanity is the Best work of life and that it happens here in Michigan where WE BUILD LEADERS. And this is just the tip of the iceberg! Don’t believe me? Watch this. If you know, Right Here, Right Now, that the Sky’s the Limit because Now More than Ever there are people who are looking to Join the Journey to Soar to Success by Building Our Future and Bringing It On to Happily Ever After, please stand up! Change can be scary. But when I look across this room at the people who are standing firm with our local chapters, I know that 2011 will be more successful then we dreamed. My friends, you have brains in your head and feet in your shoes. You will steer us in any direction you chose. You’re not own on your own, I’m here with you too – and together we will see each other soar through and through. In February, we’ll grow our organization and we’ll spread our hopes, our vision, and dreams to new places and light fires in new hearts … and that is not at all scary. Indeed – that is what makes me smile. Thank you for being on the greatest team of leaders ever assembled. May God bless you all and may He continue to bless the Michigan Jaycees. Previous Previous post: This Is The Motor City and This Is What We Do!